Concern for the environment is now a primary driver for the choice of construction products. Cost can no longer be the over-riding concern and the long term impact of product choices – in terms of performance and effect on the environment – has become more important than the short term solution. avoid adverse effect on the environment through performance in use. Clay pipes have long been recognised as the most environmentally friendly of underground pipe materials. It has long been understood that clay drainage represents the most environmentally friendly drainage option. Perhaps the main reason has been the damning reports, as well as campaigns by environmental organisations such as Greenpeace, against the manufacture of materials such as PVCu. However, clay’s environmental advantage is much more fundamental, extending to such factors as the much reduced energy requirement in production, the reduced need for bedding aggregate, the heat, chemical and abrasion resistance in service and the considerably longer service life. The clay drainage industry utilises clays and shales for its raw material. These are entirely natural and no harmful additives are required to aid production or to improve the properties of the finished product. The clay and shales used by all UK clay pipe producers are in abundant supply and will certainly satisfy the needs of the industry well into the next millennium. In addition, it is a raw material which finds little use in other industrial applications. The CPDA members operate a policy of extracting raw material from several small sites to minimise the impact in the local communities and environment. Many clays are extracted from open cast sites, during the process of coal extraction. Each has a working area below ten hectares and all are situated relatively close to the production site. In general these are in areas designated as scrub land and in all cases, CPDA members work closely with National and Local Agencies when reinstating the land after extraction. During reinstatement they have planted indigenous woodlands and established green corridors and local amenities. Energy analysis originated in response to environmental pressures. These include the need to conserve finite material resources and concern about climate changes which could result from the ever increasing release of heat into the earth’s atmosphere. Energy analysis is therefore fundamental to the planning of our economic and environmental future. The UK clay pipe industry is the most advanced in the world and has pioneered many of the major improvements in both quality and energy utilisation and as a consequence, the total energy requirements for the production of a clay drainage system compare very favourably with all systems produced from alternative materials including PVCu, concrete and cast iron. 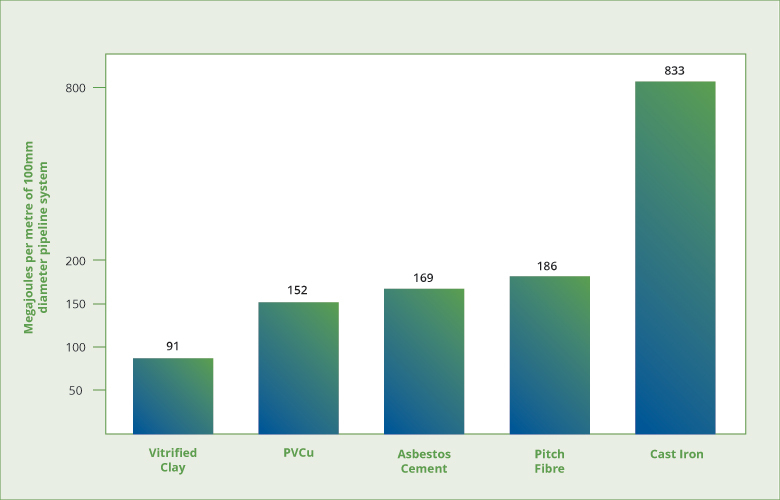 The graph below resulted from an independent comparison undertaken to look at the energy required to produce various pipes including clay, concrete, solid wall PVCu and spun cast iron. The results show clay well below all other materials, for example 40% below that of PVCu. Spun cast iron (R. Jeschar, 1995) came out on top, requiring over nine times the amount of energy as compared to clay (this is clearly the reason why this is an expensive alternative which is only used in special circumstances). For further information, refer publication The-Environmental-Aspects-Of-Clay-Drainage. The emissions from CPDA members’ exhaust stacks have been monitored for both gaseous and particulate matter over the past few years and the results show that all are within the strict limits laid down by the Environment Protection Act 1990. Despite the fact that the clay pipe industry has been in existence for a considerable period, its UK record is first class as regards industrial diseases. CPDA members’ records are excellent too regarding the disposal of production scrap. Waste products generated by clay pipe production are minimal. All raw clay scrap is returned for reuse. Most of the fired scrap is ground up and fed back into the clay mix in the form of ‘grog’, an essential element of the mix, which improves dimensional accuracy, improves performance and speeds up drying and firing and hence reduces energy consumption. Clay pipes having inherent high structural strength and rigidity can frequently be laid directly on a trimmed trench bottom, ie with no, or only minimal bedding, or with recycled aggregates (e.g. crushed demolition waste) thus significantly reducing the use of scarce and expensive prime aggregates and minimising site excavation. In contrast, bedding is critical to PVCu and other flexible pipes as the backfill forms an integral part of the structural integrity of the pipeline. A PVCu pipeline has little inherent strength and will flatten under relatively light loads unless it is fully and carefully surrounded by a bed of single sized pea gravel or similar material. As a result of this fundamental difference between the two spvcystems, significantly more imported aggregate is needed for a PVCu drainage system. Clay remains inert even when subjected to extreme temperatures or chemical attack and therefore poses no threat to human life or the environment during its extensive life. Broken or obsolete clay pipe comprises an inert material which can be returned to the earth and will have absolutely no detrimental impact whether in the shorter or longer term. Any excess fired manufacturing scrap is added to the mix in the form of ‘grog’. Site waste can be ground down in an impactor crusher to produce an excellent inert hard-core or aggregate to replace limited resource and expensive aggregate. This treatment is entirely consistent with the aims of the Department of the Environment’s revised MPG6 guidance notes to local authorities which encourage the use of secondary materials rather than virgin aggregates.